Chanteuse Country US née le 25 Décembre 1948 à Houston (Texas). Barbara Mandrell a débuté à l'age de 11 ans dans le show de Joe Maphis. 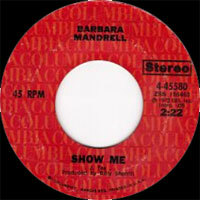 En 1966, elle enregistre pour un petit label puis en 1969, elle signe avec la Columbia, remportant la même année son premier hit. 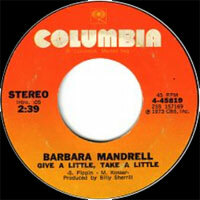 Depuis, Barbara Mandrell est devenue l'une des grandes vedettes de la Country Music. 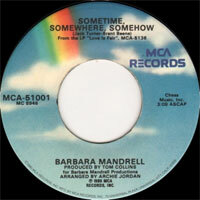 Thanks to a string of hit singles and a popular television variety series, Vocalsist Barbara Mandrell was arguably the biggest female star in country music in the late '70s and early '80s. Born the oldest daughter into a musical family in Houston, TX, on Christmas Day, 1948, Mandrell was already reading music and playing accordion by the age of five. Just six years later, she was so adept at playing the steel guitar that her father escorted her to a music trade convention in Chicago, where her talents caught the attention of Chet Atkins and Joe Maphis. Soon after, she was a featured performer in Maphis' Las Vegas nightclub show, followed by television performances and tours with Red Foley, Johnny Cash, and Tex Ritter. 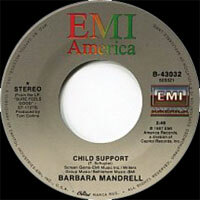 When Mandrell was 14, her family formed its own group, with her father Irby on Vocalss and guitar, her mother Mary Ellen on bass, and Barbara handling pedal steel and saxophone. The band also included drummer Ken Dudney, whom Mandrell would eventually marry. 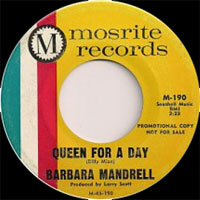 The Mandrells toured the U.S. and Asia before Barbara made her first recordings in 1963, among them the minor hit "Queen for a Day." 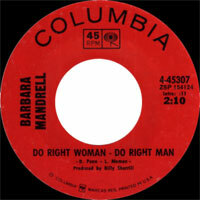 After a few more years of touring, Mandrell briefly retired in order to become a housewife, but she soon grew restless and returned to the music business. 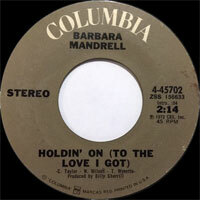 After signing with Columbia in 1969, she notched her first chart hit, a cover of the Otis Redding classic "I've Been Loving You Too Long." 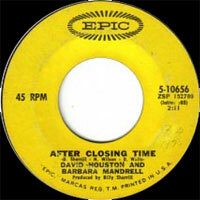 In 1970, Mandrell scored the first of many Top 40 hits with "Playin' Around With Love." 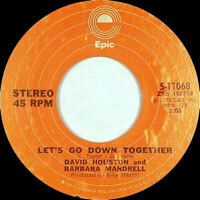 In the same year, she began performing with singer David Houston, and their partnership also generated considerable chart success. 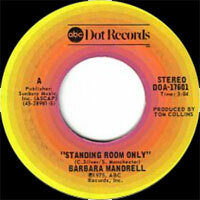 In 1975, Mandrell jumped to the ABC/Dot label, and under the guidance of producer Tom Collins reached the Top Five for the first time with the single "Standing Room Only." 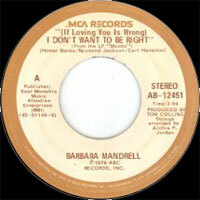 After a series of successive hits, she earned her first number one with 1978's "Sleeping Single in a Double Bed," which was immediately followed by another chart-topper, "(If Loving You Is Wrong) I Don't Want to Be Right," in early 1979. 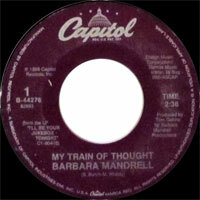 Later in the year, "Years" also reached number one, as did three more singles -- "I Was Country When Country Wasn't Cool," "'Till You're Gone," and "One of a Kind Pair of Fools" -- between 1981 and 1983, a period during which Mandrell also received numerous industry awards and accolades. 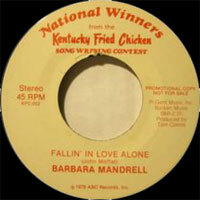 In 1980, the TV program Barbara Mandrell and the Mandrell Sisters premiered on NBC. In addition to hosts Barbara, Louise, and Irlene Mandrell, the show featured musical guests and comedy sketches. Each broadcast also closed with a gospel song, and in 1982 Mandrell released her own inspirational album, He Set My Life to Music. As a result of her busy schedule, she began suffering from Vocals strain, and on doctor's orders pulled the plug on the television program in 1982. In 1983, she premiered The Lady Is a Champ, a Las Vegas stage show, and released two LPs, In Black & White and Spun Gold. A collection of duets with Lee Greenwood, Clean Cut, followed in 1984. Tragedy struck later in the year, however, when Mandrell and two of her children were involved in a nightmarish head-on car crash that left the other driver dead. Though Mandrell and her kids survived, all three faced a long period of recovery. When she finally returned to performing a year later, the country music landscape had changed dramatically, with the "new traditionalist" movement gaining dominance while the glitzier, more pop-influenced music Mandrell favored began falling out of favor. As the 1980s became the 1990s, she began focusing almost exclusively on live performing, where she remained a significant draw; she also published her autobiography, Get to the Heart: My Story.